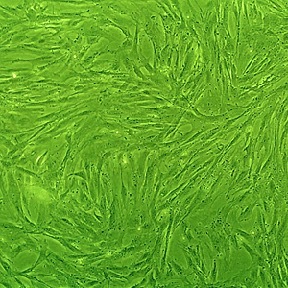 Bovine Renal Artery Smooth Muscle Cells (BRASMC) are derived from tunica intima and tunica media of normal bovine renal arteries. They are cryopreserved at second passage and can be cultured and propagated at least 12 population doublings. Studies show cyclosporine-induced renal artery smooth muscle contraction is associated with increases in the phosphorylation of specific contractile regulatory proteins. The renal artery smooth muscle is uniquely refractory to angiotensin stimulation and may be protective in the role of the kidney in regulating blood pressure through the renin-angiotensin system. (Click to Enlarge) Bovine Renal Artery Smooth Muscle Cells, BRASMC. Isolated from the vessels that supply blood to the kidneys.